The Apple Pan is exactly the sort of place you should have in mind when you think “California Burger Joint,”, if, for no other reason, this place has a solid legacy around making California-style burgers. 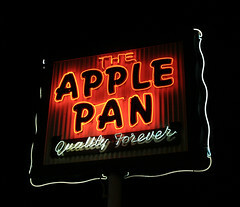 Founded in 1947, The Apple Pan has been churning out burgers from it’s modest wooden house in West Hollywood, CA for over 60 years. Walking in through the door, it’s immediately obvious that this not just a burger joint, but a bit of a time capsule. 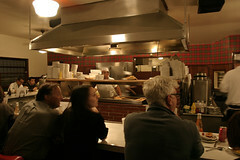 The central feature of the Apple Pan is the central kitchen area, with a grill filled with buns and burgers, a deep fat fryer, and a counter where all the condiments are prepped and the burgers assembled. Around this is a U-shaped counter with 20 or so vinyl-clad swivel seats, staffed by gentleman wearing white aprons and hats. Heck, they even use those little paper cones in the metal holders for your beverages (and, to be honest, I never really got those). The menu at The Apple Pan is pretty simple. For burgers it’s basically steakburgers or hickoryburgers, the latter being slathered with a hickory BBQ sauce. Either is available with Tillamook cheddar as well, and they’ve got fries available as a side. I opted for a steakburger with cheese, my buddy Ed opted for a hickoryburger with cheese. And we both got fries. 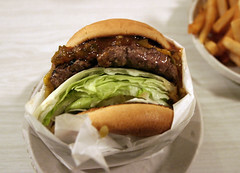 My steakburger arrived, and was your classic California-style burger, piled high with lettuce, tomato, and onion. Relish, too, which I might pass on next time. I’m not sure about this much lettuce, however, but obviously some people like it that way, since they’ve been doing it for a looong time. Otherwise, quite a good burger. Good sear on the burger, and a juicy interior. I’d like a little less lettuce and relish, but otherwise, there are a lot of burgers this good in LA, but I love the combination of the good basic burger and the old-school feel here. 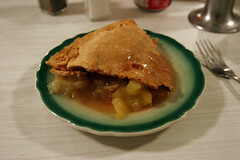 Of course, the other feature of the Apple Pan is that the “Apple” in their name comes from the fact that they serve apple pie as well (in addition to several other pies). This was the sort of apple pie I like: a nice crust, a slight tang to the apples, and a texture that’s just firm enough to barely hold together on the plate. In a slight concession to my health, I opted not to get ice cream or cheese, although both are available. Overall, a very enjoyable burger at an enjoyable burger joint. While this particular London trip was a flurry of visits to different cuisines ranging from Chinese, to Malaysian, to Turkish, I try to make it a point to visit at least a few places featuring classic British cuisine on each visit, both on the casual side of things (a near-obligatory visit to The Regency Cafe happening on this trip as well) and the formal end as well. After an informative trip to The Postal Museum and it’s related, not-to-be-missed Mail Rail exhibit taking you through old, compact mail tunnels running under the streets of London, it was time to wander down Farringdon Road and get a lunch of classic, old-school British fare at Quality Chop House.